Wow, Practice Bulletin No. 115, replacing No. 45 is a breath of fresh air. No. 45 included the infamous “immediately available” phrase resulting in a fire of VBAC bans to rage around the country, but primarily in rural areas. Surely No. 115 is in response to the NIH’s March 2010 VBAC conference and the VBAC Statement it produced. In short, VBAC is a “safe and appropriate choice for most women” with one prior cesarean and for “some women” with two prior cesareans. Being pregnant with twins, going over 40 weeks, having an unknown or low vertical scar, or suspecting a “big baby” should not prevent a woman from planning a VBAC (ACOG, 2010). What follows is a brief overview of these new guidelines. Attempting a VBAC is a safe and appropriate choice for most women who have had a prior cesarean delivery including for some women who have had two previous cesareans. The College guidelines now clearly say that women with two previous low-transverse cesarean incisions, women carrying twins, and women with an unknown type of uterine scar are considered appropriate candidates for a TOLAC. Induction of labor for maternal or fetal indications remains an option in women undergoing TOLAC [trial of labor after cesarean…Misoprostol [Cytotec] should not be used for third trimester cervical ripening or labor induction in patients who have had a cesarean delivery or major uterine surgery. [VBAC] may also help women avoid the possible future risks of having multiple cesareans such as hysterectomy, bowel and bladder injury, transfusion, infection, and abnormal placenta conditions (placenta previa and placenta accreta). The [American] College [of Obstetricians and Gynecologists] maintains that a TOLAC is most safely undertaken where staff can immediately provide an emergency cesarean, but recognizes that such resources may not be universally available. The College says that restrictive VBAC policies should not be used to force women to undergo a repeat cesarean delivery against their will if, for example, a woman in labor presents for care and declines a repeat cesarean delivery at a center that does not support TOLAC. On the other hand, if, during prenatal care, a physician is uncomfortable with a patient’s desire to undergo VBAC, it is appropriate to refer her to another physician or center. Removing the “immediately available” standard while supporting VBAC with twins, after two prior cesareans, and with unknown scars is a huge step in the right direction. It seems that the option of VBAC is now available to hundreds of thousands of women, many of whom, up to this point, were left with no choice at all. Read the whole press release dated July 21, 2010: Ob-Gyns Issue Less Restrictive VBAC Guidelines. Download the PDF: Practice Bulletin #115, “Vaginal Birth after Previous Cesarean Delivery,” is published in the August 2010 issue of Obstetrics & Gynecology. The College maintains that a TOLAC is most safely undertaken where staff can immediately provide an emergency cesarean, but recognizes that such resources may not be universally available. “Given the onerous medical liability climate for ob-gyns, interpretation of The College’s earlier guidelines led many hospitals to refuse allowing VBACs altogether,” said Dr. Waldman. “Our primary goal is to promote the safest environment for labor and delivery, not to restrict women’s access to VBAC.” Women and their physicians may still make a plan for a TOLAC in situations where there may not be “immediately available” staff to handle emergencies, but it requires a thorough discussion of the local health care system, the available resources, and the potential for incremental risk. “It is absolutely critical that a woman and her physician discuss VBAC early in the prenatal care period so that logistical plans can be made well in advance,” said Dr. Grobman. And those hospitals that lack “immediately available” staff should develop a clear process for gathering them quickly and all hospitals should have a plan in place for managing emergency uterine ruptures, however rarely they may occur, Dr. Grobman added. The College says that restrictive VBAC policies should not be used to force women to undergo a repeat cesarean delivery against their will if, for example, a woman in labor presents for care and declines a repeat cesarean delivery at a center that does not support TOLAC. On the other hand, if, during prenatal care, a physician is uncomfortable with a patient’s desire to undergo VBAC, it is appropriate to refer her to another physician or center. Hello. I am looking for information on unmedicated VBACs. My OB just told us (I’m 30 weeks) that I have to have an epidural immediately upon entrance to the hospital because that is the only way the hospital can ensure the cath was inserted correctly. I wanted to go without drugs because I am afraid I won’t be able to push adequately on medication and it will lead to another c-section. VBAC supportive OBs do not require epidurals or any kind of pain relief. The fact is, in a true emergency, they would put you under general anesthesia, they would not be fiddling with a spinal. If the cesarean is not an emergency, then there is time to properly place a spinal. You can legally decline anything, however, your OB might make things difficult for you if you don’t comply. Can you switch OBs? I read through the Bulletin no. 115 and could not find this listed – I found where it says “However, due to variation among studies with respect to indications for delivery, induction protocol, agent and dose, and subsequent use of oxytocin, it is difficult to identify an absolute risk of uterine rupture associated with induction.” This isn’t quite the same as saying that petocin is an option. I am currently with an OB that seems very VBAC friendly, but says she will not use petocin, even a small dose in conjunction with a foley cathether. As I am now overdue, my concern is that if I do not spontaneously go into labor, that I will have no option but to schedule a c-section. Where can I find this information on VBAC petocin induction to try to persuade my OB to consider a low-dose petocin induction (assuming that every other aspect of mine and baby’s health and the pregnancy looks healthy)? Thank you SO MUCH. Some OBs don’t like to induce, others are ok with it. ACOG says it “remains an option.” Unfortunately, when OBs do not wish to induce, moms are left with no choice. If a patient (Me 3 prior sections), presents one’s self in labor at said hospital and declines a section, the hospital then has to heed the wishes of the patient? Am I understanding this correctly? Does the hospital have the right to stop contractions and section the patient? This is what I’m hearing in my birthing community and I really cannot believe a hospital would/could do that. I responded to your comment here. The limited data we have on the rates of rupture in a classical incision vs. a low transverse incision reveal that the differences are significant. I personally wouldn’t attempt a VBAC after what could be two prior classical incisions. If I felt very strongly about it, I would find a hospital-based provider. You can always look for the two most VBAC supportive OBs in your area and review your medical records from your second surgery together and get their opinions. I’m sure you will find many people on-line to support you if you decided to peruse a VBA2C. You just have to decide how much risk is acceptable to you. I like to know all the variables at play, but that’s me. The data we have on birth intervals is also not very strong because the studies have been rather small (less than 5,000 woman after a cesarean.) 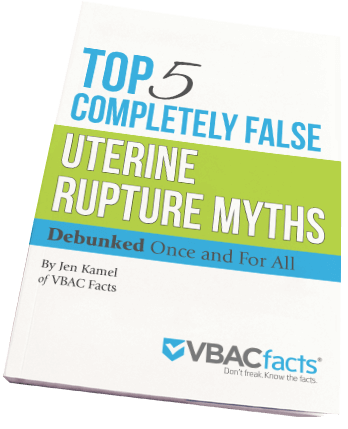 You can review an over here: https://www.vbacfacts.com/2011/11/11/birth-intervals-uterine-rupture/. I covered the new ACOG guidelines (and in particular, the changes about VBA2C) on my blog. I agree that they have a long way to go to eradicate the harm that came from the “immediately available” change and they have GOT to be more aggressive about preventing more primary cesareans in the first place. Good to see you blogging again, Jen. Thanks Kmom! It’s been hard to manage it with my adorable children pulling at my skirt, but this was to big not to mention! I agree that this bulletin is more sophisticated than the one it replaces (which is 54 by the way, not 45), but it isn’t enough for ACOG to just back pedal and issue a new bulletin. The original “immediately available” bulletin had a huge impact on hospital policies, medical practice and women’s health. As I said in my own blog entry about this issue, there is going to have to be a more deliberate effort to dial the cesarean rate back from where it is than what can be expected from the issuing of a practice bulletin such as this. I just wanted to drop a line to let you know that I saw your hello comment on my blog, and that I’ve been reading your stuff for a very long time! I was inspired by Gina’s most recent post to come over and say thank you for all your hard work for VBACing moms.